How great would it be to step onto the ice next season and be BETTER than the last time you skated? Well it is quite possible and the summer time is a great time to sharpen some of your skills. The only thing that is coming in between you improving over the summer is yourself, below I have made a list of 6 ways you can improve. You don’t need ice-time to work on your shot, in fact last summer I improved my slapshot by 20 MPH (yeah it sucked before) by simply training with a radar gun and making note of what improved my power and what didn’t. What was the trick? There was no trick, I just got a radar gun and made a commitment to shoot 100 pucks a day (taking some days off of course). 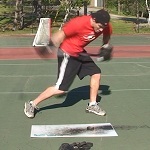 While shooting my muscles naturally became better, stronger and more effecient at performing the slapshot. I was training them while shooting over and over, and the radar gun helped me notice my improvements and motivated me to keep shooting. Go to a hockey Camp! Thanks a lot for reading the article, you can share it with the tools below, and don’t forget to join us on facebook! My biggest problem is all of the stick n shoots are 3pm, while I am working, so I have no time to practice between games. This article has me trying to work some of these ideas in when I can. Thanks! Hey, I was wondering if you have any tips for skating and endurance? By the way, I love the articles, they really help. Thanks I hope I am ready for my tournament tomorrow!!! On the stick handing video Jeremy used a a black cylinder so he couldn’t use his bottom hand but you can also use the center of a roll of toilet paper. I ordered your book ‘complete guied to stickhandling ‘ on Oct 18th, 2013. I haven’t get that yet? Could u please check that for me! Thanks very much. Love the Greenbiscuit…it should be in everyone’s bag! I play roller hockey on my driveway all the time. My street also has a slope, so I skate up it as hard as I can. I just use a street stick and hockey balls in out side, but in my room I have a slideboard, ice sheet, and a passer. I also just stickhandle anything around the carpet in my room. I HAVE THE SAME PROBLEM AS EVERYBODY ELSE……..
A couple of points I might want to add here guys. Remember to take into account the added height you are when you’re wearing skates. When your shooting off ice use a stick that is shorter than your on ice stick ( about 2.5 inches) to compensate for not having skates on. Also, for off ice shooting and stick handing just go down to your local home supply store or lumber store and buy a 4×8 sheet of 1/4″ puck board. Costs about 40 bucks. Saves sticks and Is more slippery like ice to stick handle on. Hey, i’ve been chooting off-ice for around 2 years straight and I must say my shot has A LOT of power, precision and speed but when it comes to playing on ice, my shot isnt near to what it is off-ice. Any tips or ideas? Luca, I’m in the exact same position. My shot off ice is SO much more powerful with a great spin on the puck. But, for whatever reason when I get on the ice my wrister and snapper are just plain lousy and it’s embarrassing and frustrating… My slapshot is about the same or better, same with my backhand..I just can’t seem to get it. I had this problem as well when I was younger, the pavement provides more resistance when shooting on the ice. Once you get used to shooting off pavement then it seems weird to shoot on the ice. The reason is because the puck moves faster on the ice, all it takes is a bit of practice on the ice and you will be able to adapt. I think of it as 2 steps forwards, one step back. You are improving your shot when you practice off the ice, but you need a few minutes to tweak your shot once you get on the ice again. Jeremy it’s been way too long since the last article but still a good one! On another note, switching to a left handed shot has improved my defensive game but I still lack passing skills and shooting from the left side. My left side backhand is way better though! I’m having difficulty translating off ice shooting to on ice, off ice my left handed shot is way better! Looking forwards to next season and hopefully some off season articles! Thanks as always Jeremy! Hey Matt, that is normal for being better at shooting off the ice. Think of it as 2 steps forwards and one step back. You are still improving your on-ice shooting, but it feels like you are better off the ice. The thing is there is more friction when you shoot off-ice so when you get on the ice you have to be a bit quicker. Thanks for posting this article the stickhandling part helped! Another adult hockey camp in Minnesota is Lifetime Hockey, which hosts a week long course each summer.